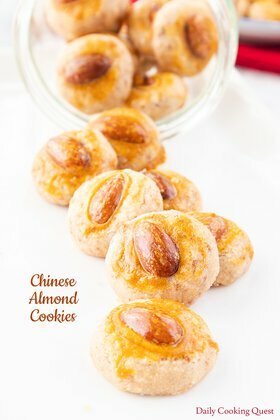 Pineapple tart cookies are Chinese New Year must have cookies. 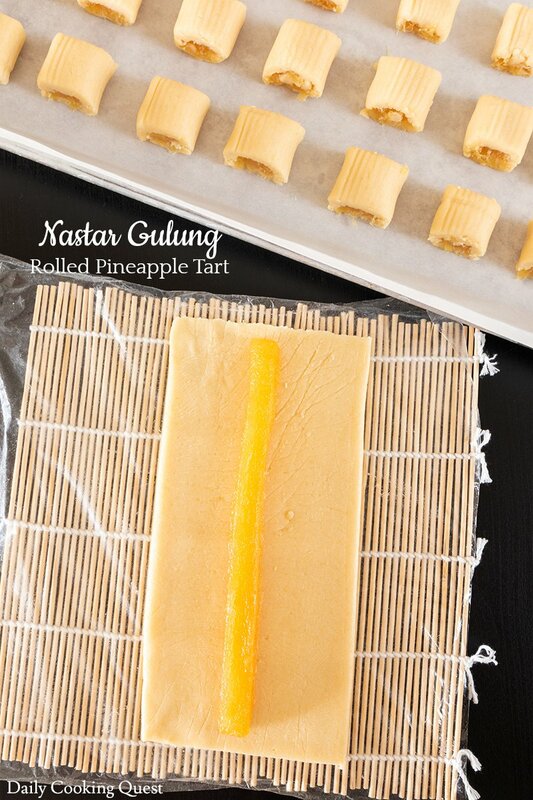 This version incorporate grated cheese into the tart crust, with and easy to handle log shape cookies. 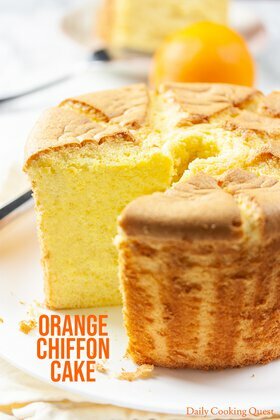 Every year when Chinese New Year approaches, most Chinese families will start with the huge task of preparing mountainous amount of baked goods. 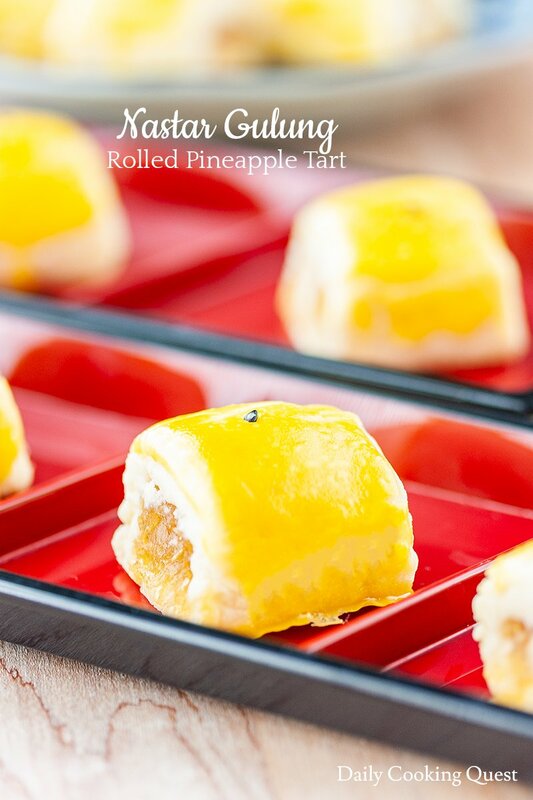 The most ubiquitous among these baked goods is definitely pineapple tarts. There are endless variation of tart crust among individual families. After so many years and testing so many different crust recipes, I consider this my favorite tart curst. It has plenty of grated parmesan for the cheese lover in me, with minimal to non-existent expansion while baked so they retain their shape really well, and best of all, they simply melt in your mouth. My usual game plan is a two-day process. The first day I simply prepare the pineapple jam filling and let them chill in the fridge overnight so I can be extra sure it will be completely chilled when I shape my cookies. Chilled filling makes the shaping process so much easier. You can use fresh pineapple, or you can use a can of crushed pineapple. Both works well, so if you want to save time and money, the canned pineapple is really not a bad option at all. One note for those who has never make this before, just be extra sure to make your jam filling extra dry and extra stiff. This is not jam for your morning toast, you need the jam to be extra thick paste. Imagine the thickness where you can shape the jam and it stays like that. If you want your tart crust to be as not expanding as possible, I have two tips. First, stick to using powdered sugar. 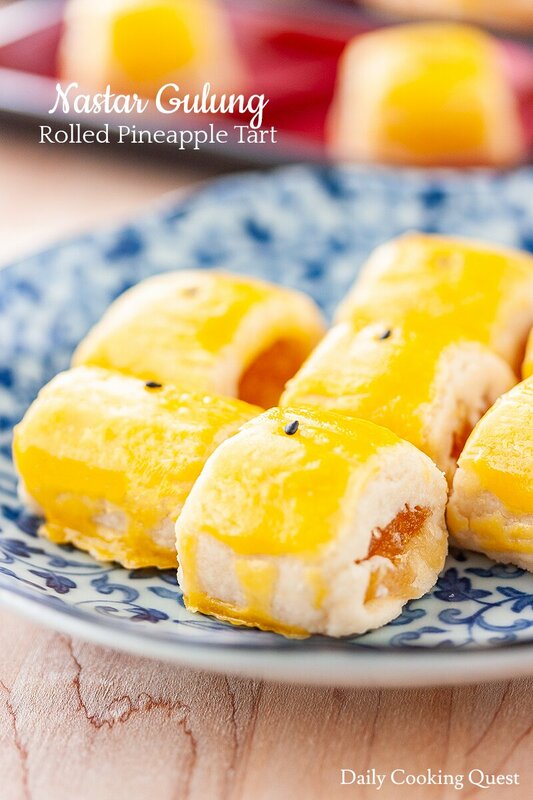 If you use regular granulated sugar, it will definitely expand in the oven, which is highly non-desirable in a pineapple tart. Second, be sure to chill your shaped cookies in the fridge while you preheat the oven. This step is crucial to help solidify the butter, which means, your cookies won’t expand in the oven. If you need an extra guarantee, you can even chill your shaped cookies overnight and bake the next day. 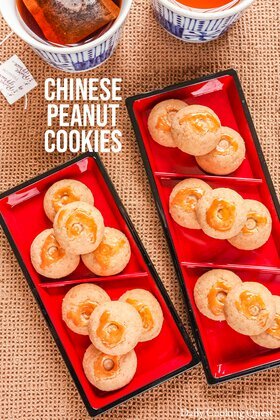 The icing on the cake, or in this case, the glossy golden crust on each cookie is achieved with an egg wash. To get that shiny golden color with smooth satiny finish, we need egg wash of egg yolks, and not at the start of the baking. Rather, I usually bake the cookies half way, in this case 20 minutes, then remove from oven, quickly apply egg wash and decorate (if desired), and bake for the remaining time. This is mainly for insurance. In case my cookies end up expanding a bit, I would rather they finish expanding, and then I apply the egg wash so there is an extra guarantee the top glossy finish will be smooth with no cracks. If you are super sure that the cookie dough will 100% not expand while baking, or if you don’t mind having minor cracks on the glossy surface, feel free to apple egg wash prior to baking, and just bake your cookies for the entire 35-40 minutes straight. Boil pineapple, cinnamon, and cloves in a sauce pot over medium heat. Cook until quite dry and there is no standing liquid visible in the pot. Add sugar and salt. Stir, cook until really dry, but make sure there are no burnt bits. Set aside to cool completely in the fridge. Cream together unsalted butter, powdered sugar, and salt. Add in egg yolk, and beat until well mixed. Sift together cake flour, cornstarch, and milk powder. Add this into the butter mixture and stir until well mixed. 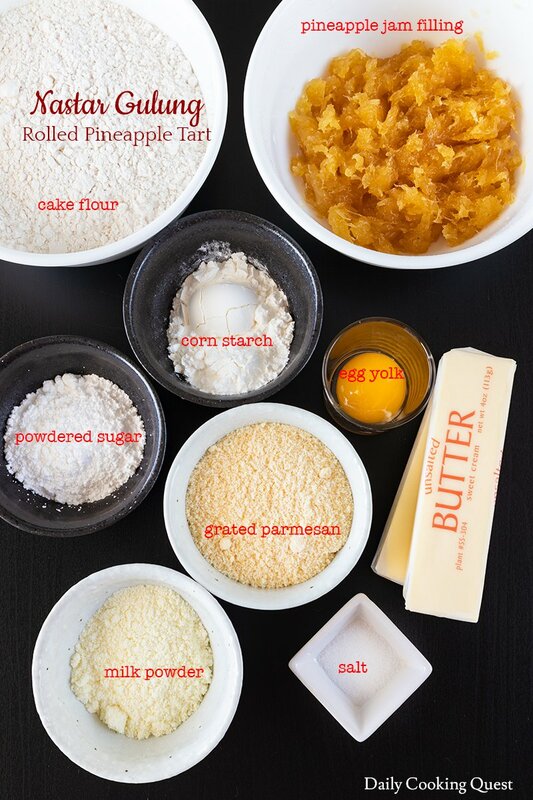 Add in the grated parmesan/cheddar, mix well into a workable cookie dough. Line a baking sheet with parchment paper. Divide the dough into 5 portions. And, divide the pineapple jam filling into 5 portions. Repeat until all dough and jam filling is used up. Preheat oven to 150 Celsius (300 Fahrenheit). Chill the shaped cookies in the fridge while the oven is preheating. Once the oven temperature reaches 150 Celsius (300 Fahrenheit), remove the cookies from the fridge, and immediately bake in preheated oven for 20 minutes. 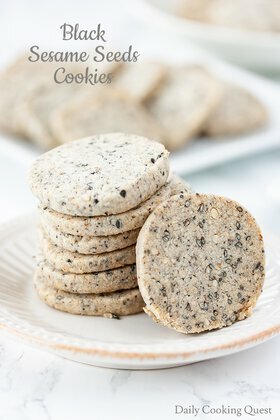 Remove from oven, then apply egg wash on top of each cookie, and decorate with black sesame seeds. Bake again for another 20 minutes, or until golden brown. Once the cookies are completely cool, store in air-tight container. (*) I use a sushi bamboo mat to help with the rolling. You can use all-purpose flour too Alice, the cookies will just have less melt-in-your-mouth texture compared to cake flour. Milk powder gives umami to the cookies, but you can safely omit if it is hard to find. Or, if you can find malted milk powder from Ovaltine or Carnation, that should work too. 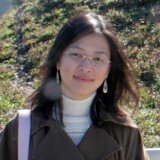 Hi Anita, I never liked nastar my whole life, I always eat other cookies during Hari Raya. The reasons because mostly nastar I tasted was overly sweet that made my tooth ache, but it seems now I like (this) nastar after tried your recipe (my friend sent me your recipe link). So, I made these today, I used just normal white flour, reduce the sugar as my taste bud like in pineapple jam then follow the instruction, turn out it so so good & melts in your mouth, love it! So thank you. Oh, your comment really made my day Indri. I am super happy you finally found the nastar recipe of your dream. :) Just like you, I don't like things that are too sweet, and ended up baking most of cookies and desserts on my own. I finally made it! People like the tart filing in general; I substituted sharp cheddar for parmesan based on availability. I think the dough to filling ratio could be improved, about 20% less dough might be better. Or maybe I just like a lot of fillings in my nastart :) Thanks for the recipe Anita!